Rosacea (rose-AY-sha) is a chronic skin disease that causes redness and swelling, primarily on the face, and can also affect the scalp, neck, ears, chest and back. Those afflicted with rosacea may first notice a tendency to flush or blush easily. The condition can occur over a long period of time and often progresses to a persistent redness, pimples and visible blood vessels in the center of the face that can eventually involve the cheeks, forehead, chin and nose. It is often passed on in families, with women being afflicted more often than their male counterparts. Men, however, often get more severe forms of rosacea. For women with rosacea, increased flushing and blushing may occur around and during menopause. While the precise cause of rosacea remains a mystery, researchers believe that heredity and environmental factors are to blame. One explanation is that something causes the blood vessels to swell. The result, these scientists believe, is the flushing and redness characteristic. Another theory is that a mite called Demodex folliculorum, which lives in hair follicles, could be a cause. The belief is that the mites clog oil glands, which leads to the inflammation seen in rosacea. Others believe that a bacterium called Helicobacter pylori, which causes intestinal infection, might be a cause. 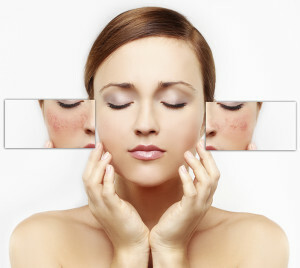 The immune system also has been implicated as playing a role in rosacea’s development. Depending on your skin type and condition, there are several effective treatments including IPL, prescription creams and oral medications. Come in for a consultation with one of our board-certified dermatologists to discuss the treatment options right for you.